I’m going to outline my thoughts on the rest of the enhancements to the 1.1.3 release of the firmware in my next post, but for now I’d like to skip to the feature I was most excited about since the news was leaked – upgraded Google Maps with a pseudo-GPS function. But the big news in this Maps upgrade is the Location feature. Now some argue that consumers don’t really need GPS, they just need to know roughly where they are, and for that the far less accurate geolocation (as per the iPhone’s Location feature) is good enough. It may be true in Swindon – you can tell where you are owing to the grim looks and tracksuits – but in other locations pinpoint accuracy is indispensible. So Location in Google Maps may prove useful in some areas, but it’s no replacement for true GPS. I’m eagerly awaiting partfoundry’s GPS add-on or a new iPhone with GPS built in. This feature seems a bit inconsistent. 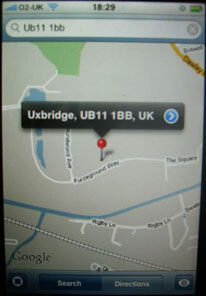 Within Maps itself, searching on just a postcode, say “UB11 1BB” will find the location. However, tapping on the Address field in Contacts (where most people’s addresses will be stored) yields different results. When inputting a Contact on the iPhone, the country is automatically set as “United Kingdom”. Even entering just the postcode usually yields a match in Maps. However, if you’ve input your contact’s address in Address Book on your Mac and not set the country to UK, then Maps will append “United States”. 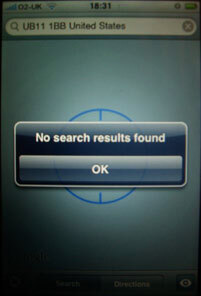 It will then try to search for “UB11 1BB United States” and fail to find a location. Unfortunately there is no option in Address Book or Applescript that I can find to change the country field en masse. I don’t know what the situation is like when syncing with Outlook on a Windows machine, so I would appreciate feedback in comments. This is a problem as many people will have migrated quite a few contacts over, and won’t want to sort them all out manually. Surely a search where the country is not specified should default to the country based on the phone network, not just the US? Some localisation is needed here, as is better communication between Contacts and Google Maps. Alternatively Apple could add an option within Address Book to set the country for many contacts, or enable the user to choose their preferred default country within Google Maps, as they can on the desktop. The UK is getting the short end of the stick on live traffic information. As far as I can see we don’t get any, at least not in Berkshire, as the Show/Hide Traffic option makes no difference. Maps is still one of the “Wow” factor items that people love when they see the iPhone (“You zoomed in right to my house!”), but I have to say I’m a little disappointed with the inconsistencies. I’m not knocking a free upgrade because some little annoyances have been eliminated, but I was expecting great things that haven’t quite been delivered. Next: More on the rest of firmware 1.1.3’s enhancements, including why a sticky shift key should be something to shout about. Locate Me has been quite successful for me… on two occasions it has pinpointed me to within about 100 metres. 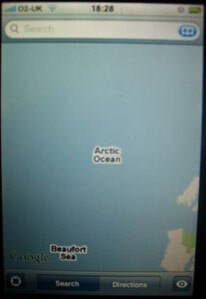 Would still like to see proper iPhone GPS though. 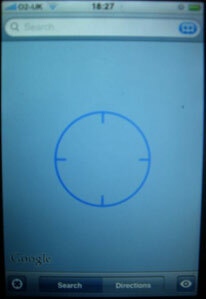 Hi Matt, Saw your your iphone tips on Steve Litchfield’s smartphone show, they were useful. Here in South Wales the location has worked well. Is there a site where one can suggest improvements to the OS, I used Treos for years and there were a couple of apps that I loved and would love to have on the iphone. One irritant is the alarm which I set to remind me and is inadequate both on volume and the shortness of the sound, unless I’ve missed something. I have now bookmarked your site so will be a regular visitor. Thanks, Mel Jones. I’m glad you found the tips useful I’ll be doing a few more in the next show. I’m also planning a series of looks at different parts of the iPhone UI, with my take on what can be improved (I agree with you about the alarm though). It just seems that paid work is getting in the way of the fun stuff! hi, i’ve the same problem with the default to united states using outlook/windows… really annoying ! found any solution yet ? It seems that neither of these are quite up to scratch in the UK, at least in my experience. Having got a hacked iPhone on T-Mobile I have been unable to test out the locate me feature although I am loving all the other new features. I too am a bit annoyed by how Google Maps works. I have properly formatted UK addresses for some of my contacts with United Kingdom at the end but it can never find it when I tap the address in contacts. Instead I’ve had to search for postcodes then drop a pin to get it more accurately then bookmarked it. The only quirks I have about the iPhone now is it would be nice to see GPS, proper bluetooth support so I can send and receive stuff between my friends, copying text would be nice, SMS forwarding and increased volume from the external speaker. Those are all things I can live without though and this is easily the best phone I have ever used.